246 pages | 39 B/W Illus. Artistic practices have long been disturbing the relationships between art and space. They have challenged the boundaries of performer/spectator, of public/private, introduced intervention and installation, ephemerality and performance, and constantly sought out new modes of distressing expectations about what is construed as art. But when we expand the world in which we look at art, how does this change our understanding of critical artistic practice? 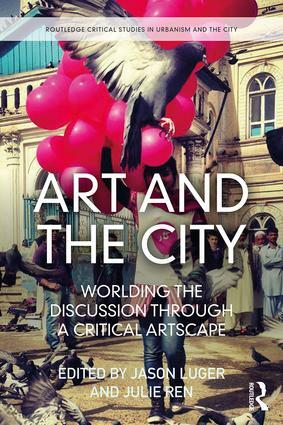 This book presents a global perspective on the relationship between art and the city. International and leading scholars and artists themselves present critical theory and practice of contemporary art as a politicised force. It extends thinking on contemporary arts practices in the urban and political context of protest and social resilience and offers the prism of a ‘critical artscape’ in which to view the urgent interaction of arts and the urban politic. The global appeal of the book is established through the general topic as well as the specific chapters, which are geographically, socially, politically and professionally varied. Contributing authors come from many different institutional and anti-institutional perspectives from across the world. This will be valuable reading for those interested in cultural geography, urban geography and urban culture, as well as contemporary art theorists, practitioners and policymakers. "This thought-provoking anthology is the fruitful result of a concerted effort by academics, arts practitioners, and art-activists, offering an original critique of how today’s urban artscape is being critically reshaped from the local to the global. The collection attends to the subversive potential of urban public-art practice, while providing an apt reflection on its constructive role as catalyst for social, political, environmental and geopolitical challenges. Multidisciplinary in approach, the richly illustrated case studies, traversing the Global North and South, reveal how local / global grassroots artivism and arts movements may boost citizen participation, bridge social and cultural difference, and claim both public and institutional spaces for promoting better alternative urban futures. Luger and Ren’s edited compilation is essential reading for students and scholars concerned with the urban nexus of art-making, space, identity and resistance." Martin Zebracki, School of Geography, University of Leeds, UK. Jason Luger is an urban researcher and Lecturer at the University of California, Berkeley, United States. Julie Ren is a Fellow in Human Geography at the London School of Economics, United Kingdom. The Routledge Critical Studies in Urbanism and the City Series offers a forum for cutting-edge and original research that explores different aspects of the city. Titles within this series critically engage with, question, and challenge, contemporary theory and concepts to extent current debates and pave the way for new critical perspectives on the city. This series explores a range of social, political, economic, cultural and spatial concepts, offering innovative and vibrant contributions, international perspectives, and interdisciplinary engagements with the city from across the social sciences and humanities. It will appeal to upper level undergraduate and postgraduate students, as well as scholars, working in urban studies, planning, geography, geohumanities, sociology, politics, the arts, cultural studies, popular culture, philosophy and literature.